We’re going to visit together how world class amplify courage so they can act and get the results they want by leveraging their past and their roots. Let’s face it, anything worthwhile in our lives that we acquired and allowed us to expand further, required courage. As one of my mentor Mary Morrissey would say, fear is the border of the reality that we know. Courage is the element and character that allows us to cross the unknown territories. Courage allows us to act during uncertain times, and as we know the only way to get results is to act. So, courage is an active component that is necessary to manifest. Before we go further, quickly I wanted to quickly remind you of last week blog and video what we discussed- HOW LEGEND PERFORMERS OUTPERFORM THEIR COMPETITION BY MASTERING “ONE” SINGLE PROMINENT SKILL? First let’s dive into the root and origin of courage. Courage comes from Latin root word “Coeur”, which means heart. In a way, an act of courage requires people to step beyond the logic brain and the seen; courage allows us to stretch ourselves and to go beyond our comfort zone. Courage requires a motive and a heart pull toward our intention, the definite purpose we’re after. Courage is needed for anything that allows you to grow and become the bigger you. The question then is, “How do you use your roots, or past” to amplify courage? Courage is needed to go beyond fear. Why do we get fear? Fear is born out of uncertainty. 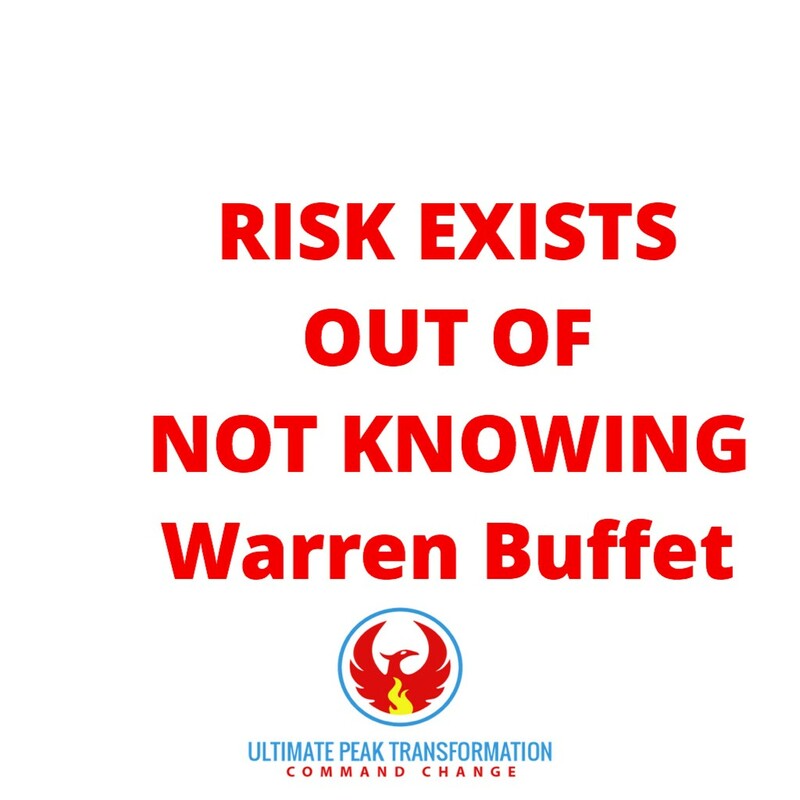 Warren Buffet, one of the icon investor of our modern times, shares his wisdom relative to investing –that risk “exist” out of Not knowing. Not knowing, creates fear for most of us, and that’s what freezes people to NOT act. This is where the leverage comes in. How do you use your roots, your past to create knowingness? When you know, that you know, you generate certainty, which eliminates the doubt. Your deep knowing fosters you to take action, furthermore to get results. This is why, many teachers talk about having clarity on your why-. Clarity main role is to help defined what matters the most to you. Clarity help make things understandable. When you have clarity, the “yes” is clearer and the “no” becomes more decisive and punctuated. Having clarity allows you to prioritize faster. What helped me to understand this principle was the understanding that- in order to manifest and ground our ideas into physical form- we need to embrace “restriction” or “limitation”. It sounds counter intuitive for someone that longs freedom like myself; but the reality is that for example discipline allow you to build structure and develop more freedom actually. If you have self-discipline for example in your eating habits, you can choose to eat healthier and then that gives you the freedom to be more vibrant and healthier. Self-discipline to Not eat everything and restricting yourself gives you the freedom you need to live longer and be more productive. That’s fundamental- clarity allows you to be more productive, but even more it allows you to gain more courage. When you know your roots, when you know who you are- you have that certainty- it’s a fact that cannot be taken away from you. You can build on that. The easiest way is to claim a piece of heritage, or roots or past that you are always proud of. The devil’s advocate would say, what if I’m not proud of my roots or past? This is where the masters and champions rise. They use one optimal tool- they switch it around, by asking themselves- What could I learn from the past/roots/heritage that could serve me? How can I utilize the bad memories as learning lesson and stepping stones to claim what I want for myself? Stanford Ph researcher Carol Dweck coined it “the growth mindset.” In her book Mindset. The reality is this- people trained with this framework are always in the learning mode and will always grow. So, to bring it home, for example, if someone as a past that they are Not proud off, the champions turns it into a learning lesson on things to avoid in the future. As an example, if someone has had an abusive parent, one of the “learning” could be going forward, I want to make sure that my children do not suffer what I went through, so I know what I don’t want- which also is form of clarity. Not knowing what you want is also a good boundary settler; mainly because you learn what you stand for and what you can tolerate. In a way, regardless of what happened in the pass, you can build on that knowingness as a benchmark to generate more courage. The way you do that is by being grateful about the experiences you have been exposed to. By claiming your roots and your learning, you are grounding your certainty. As you claim your certainty, and your knowingness, you can acknowledge your experiences and your learnings. As you step to acknowledge what you have, you are stepping into gratitude which is the frequency of abundance. The big secret here is that you cannot be grateful and be fearful at the same time. It becomes a reinvigorating power, all the way from using your roots or past to move forward and step into courage. The way you step into courage, is to step into what you know. How do you generate courage? Please comment below… and share if you find this useful.